c 1325 2nd (of 4) cast by William le Belyetere. 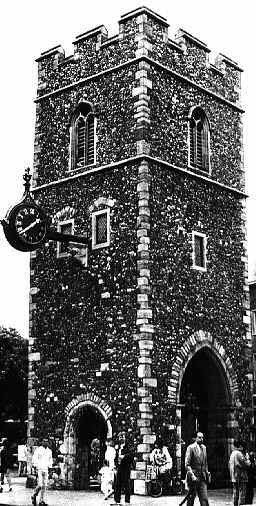 1616 A bell was cast for St Mary Magdalene, Canterbury by Joseph Hatch. 1623 Tenor (of 4) and a clock bell cast by Joseph Hatch. 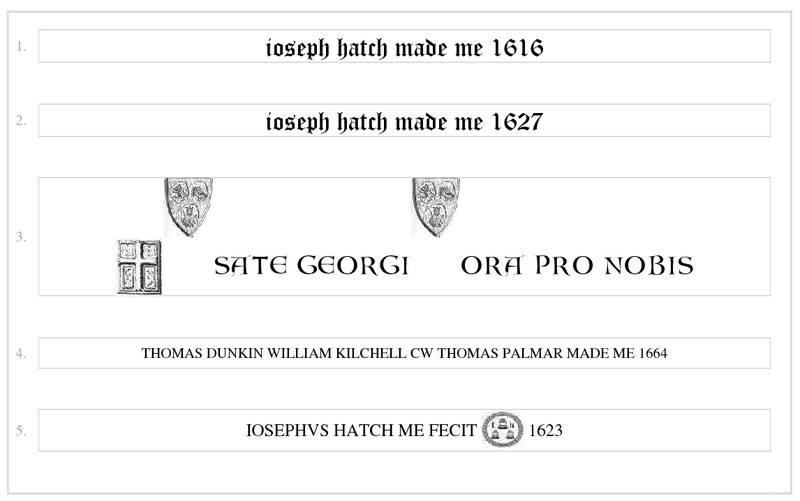 1627 Treble (of 4) (re)cast by Joseph Hatch. 1664 3rd (of 4) (re)cast by Thomas Palmar I. 1788 Base of turret pierced to allow for a pedestrian walk. 1791 The turret was demolished as it was unstable. It had contained a clock bell. A spire was placed on the tower. 1871 Parish united with that of St Mary Magdalene. 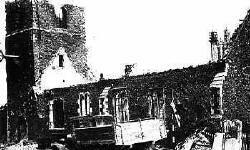 St Mary's was demolished and its treble bell was transferred to St George to be the treble of a ring of 5 in F sharp minor. 1872 Church was extended following the merge of parishes. 1887 Stahlscmidt recorded 4 bells and a clock bell. 1925 Bells rehung with chiming fittings in the old frame by Mears & Stainbank. 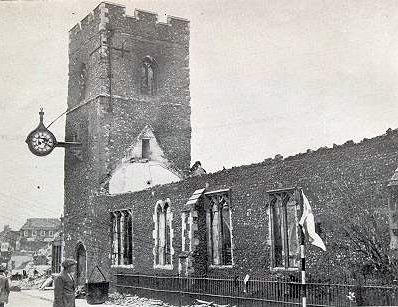 1942 The church was gutted by fire during an air raid on 1st June. The clock stopped at 2:18 am). The bells crashed and partly melted - they were subsequently "lost". The Rector requested the September PCC that "Any bell metal should be sent to Mears & Stainbank as there might be enough to cast two bells for the new church". It is not known if this was done. 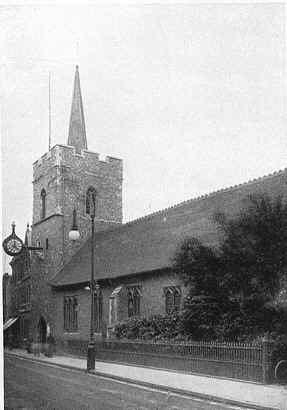 1945 The parish area of St George's was united with St Martin with St Paul and St George's Rectory in Ersham Road became the Rectory for the new parish. It still has the "George and Dragon" external mural from its pre-war days. A new church was to be designed by Mr Curtis Green, Architect, with a tower. 1951 In April, following the collapse of Eastwell Church, Mr Curtis Green applied for the bells and frame to be made available for the new St George's. 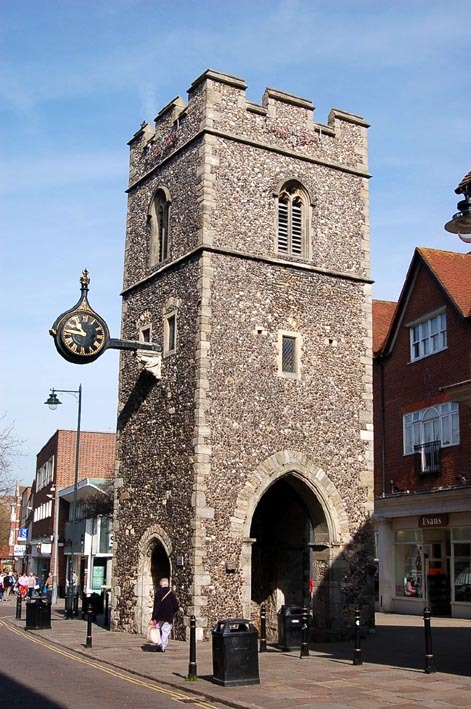 In December the Diocesan Registrar was told by Gilllett & Johnston that it was highly unlikely that "the Eastwell Bell and Frame would fit into any other tower". On the Registrar's advice, the Vicar and Churchwardens of Eastwell sold the bells for scrap. Mr Curtis Green expressed himself "very disturbed by this action." 1952 Eastwell bells were taken out and sold in January. 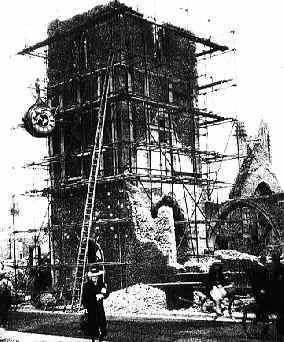 In October the church was levelled apart from the tower which stands in the pedestrian precinct as the St George's Clocktower. 1953 It was decided not to build a grand new St George's on Barton Estate, but a Mission Church, dedicated to Queen Bertha. 1955 May The clock dials were restored with 2nd hand movement and set going. 2009 Following failure of the dials the clock eventually stopped. It was decided by the City Council to remove it and restore it to its pre-war appearance. 2010 21st January The clock having been replaced on the tower to the 1836 designs was again set going. This picture was taken a few days after the church was damaged by the air raid of 1st June, 1942. The tower was largely intact. 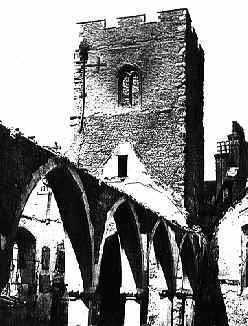 However, just under a fortnight later, the demolition gangs moved in to pull the church down. 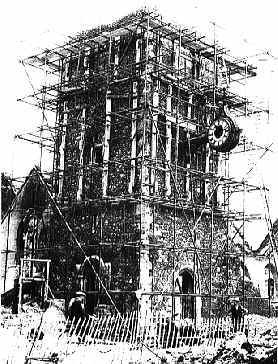 Part of the tower was dismantled (as can be seen above) before concerned citizens could intervene to save it. 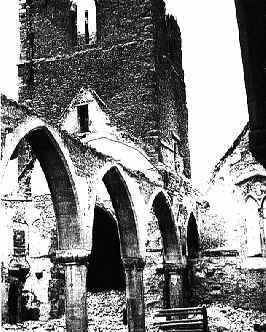 Another picture of the burnt out church. By 30th July, the scaffolding was complete. 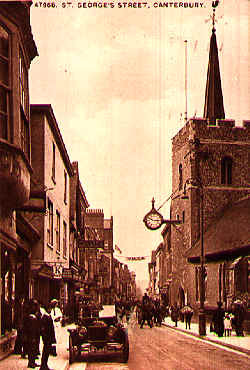 St George's Church as it appeared before the War. 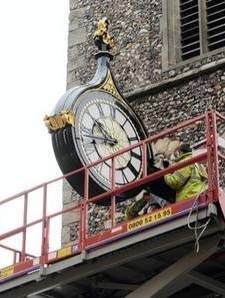 The new clock set going in 2010 harks back more faithfully to the original clock on the bombed out church. 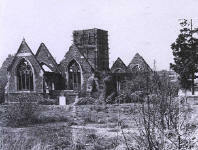 Another view of the bombed out church. Woodcut of the late steeple in 1825 edition of Gosling's "Walk around Canterbury"